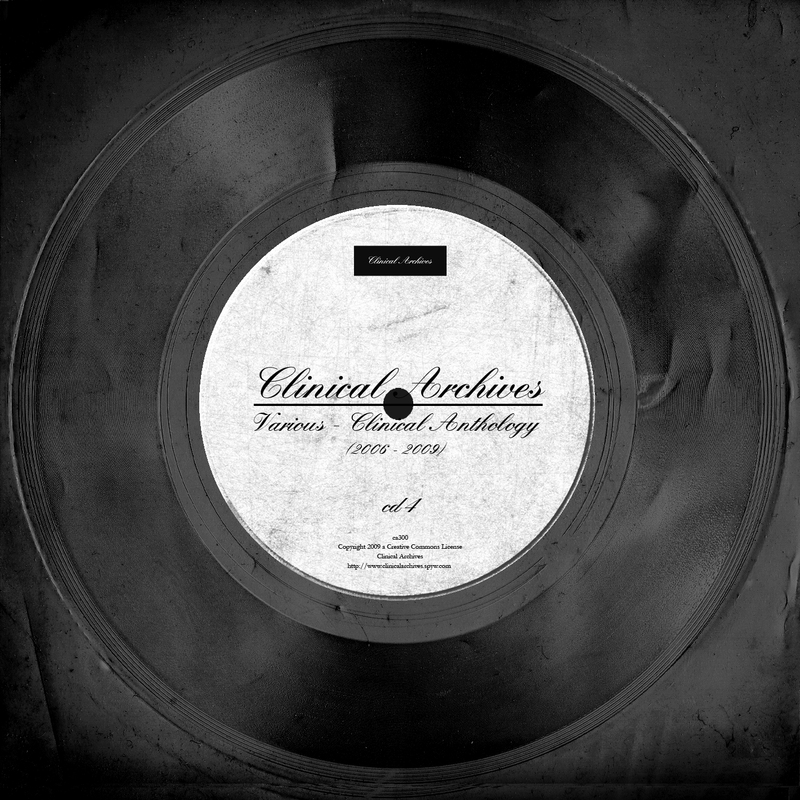 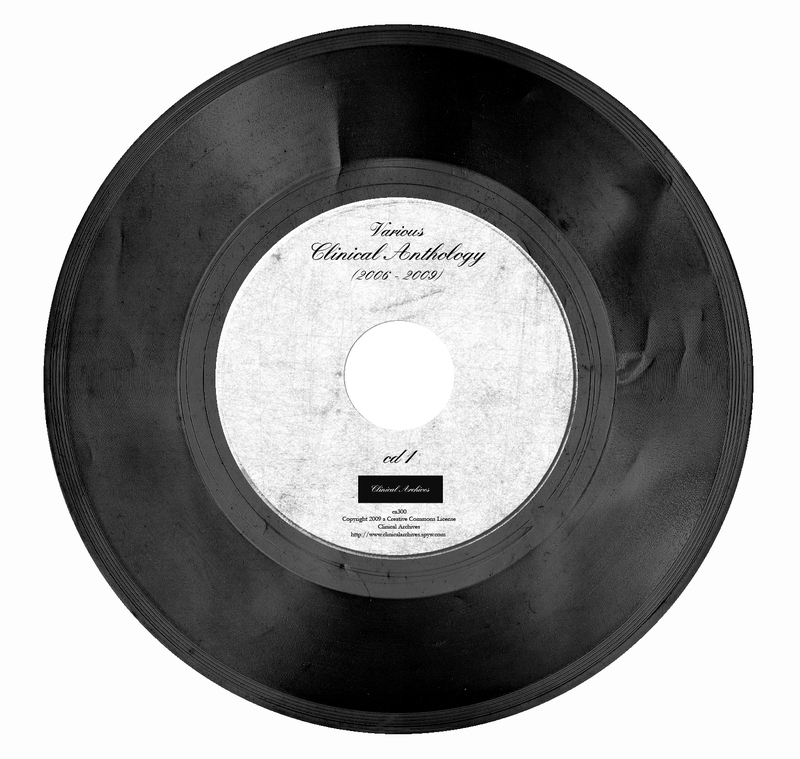 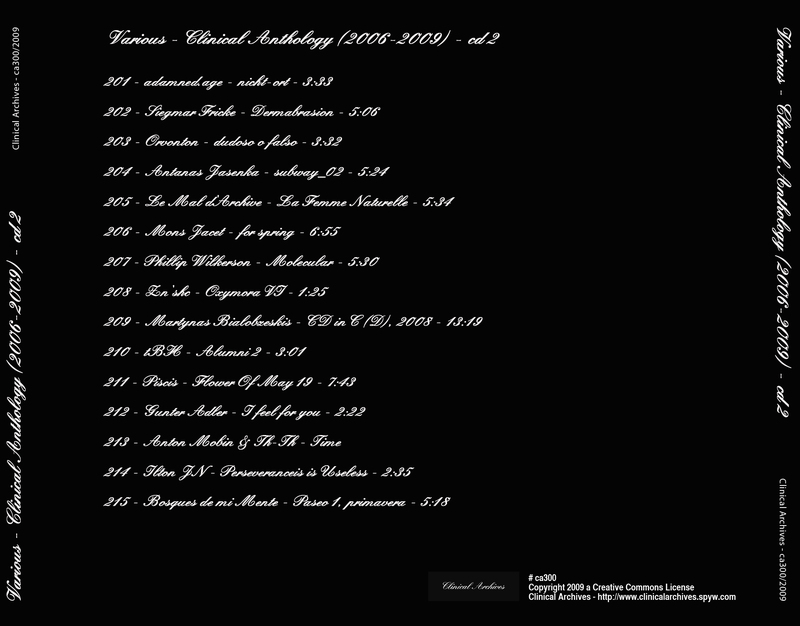 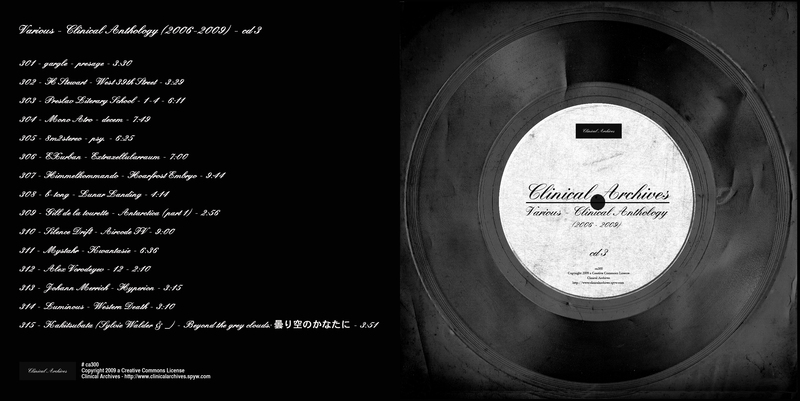 Eclectic and illogical compilation from different releases of a netlabel Clinical Archives of the period with 2006 for 2009.
from album "ca189 - Zaus - Congregation"
from album "ca270 - pandoras.box - Barriers"
from album "ca180 - John Ellis - Map of Limbo"
from album "ca186 - March Rosetta - Late in Time"
from album "ca056 - zero consequences - Zoloft - ep"
from album "ca158 - Rabotnik - Rabotnik"
from album "ca225 - Alexei Rafiev & Alexei Borisov - Znamenie Presvjatoi Bogoroditsy"
from album "ca156 - Knyaz Mishkin - Na Kuccyu"
from album "ca280 - Голуби и Безумные Кашевары (Pigeons & The Insane Porridgemakers) - Le Voyage"
from album "ca260 - Interkosmos - Interkosmos"
from album "ca262 - Orquestra Popular De Paio Pires - Orquestra Popular De Paio Pires"
from album "ca290 - Zack Kouns - I lift my hands against the gods"
from album "ca257 - Subterminal - Insight"
from album "ca221 - dmyra - Love in the Air"
from album "ca291 - Keith Morris & The Crooked Numbers - Live Candy"
from album "ca172 - adamned.age - nicht-ort - ep"
from album "ca034 - Siegmar Fricke - Selective Resections"
from album "ca112 - Orvonton - Remitente"
from album "ca088 - Antanas Jasenka - giip [Live in New York, 2007]"
from album "ca206 - Le Mal d'Archive - Les Petite Morts"
from album "ca082 - Mons Jacet - alcoholics go melancholic"
from album "ca142 - Phillip Wilkerson - Microlinear"
from album "ca160 - Zn'shñ - Oxymora (mini-EP)"
from album "ca205 - Diissc Orchestra - D.O." from album "ca134 - tBH - Book of Salms"
from album "ca227 - Piscis - Black Maria"
from album "ca058 - Gunter Adler – The Silver Book - ep"
from album "ca289 - Anton Mobin & Th-Th - A Hypnotic Versus Time"
from album "ca116 - Ilton JN - The Rats Rain Down - ep"
from album "ca104 - Bosques de mi Mente - LO-FI"
from album "ca243 - gargle - looming - ep"
from album "ca278 - H Stewart - Letters to Kansas City"
from album "ca150 - Preslav Literary School - Autumn Bricolage"
from album "ca031 - Mono Atro - MDCCLXXVI"
from album "ca102 - 8m2stereo - tacet"
from album "ca168 - EXurban - Makrolid - EP"
from album "ca009 - Himmelkommando - Arctic Linqua"
from album "ca137 - b°tong - Microsleep"
from album "ca080 - Gill de la tourette - Antarctica"
from album "ca140 - Silence Drift - Aircode"
from album "ca111 - Mystahr - POO!" 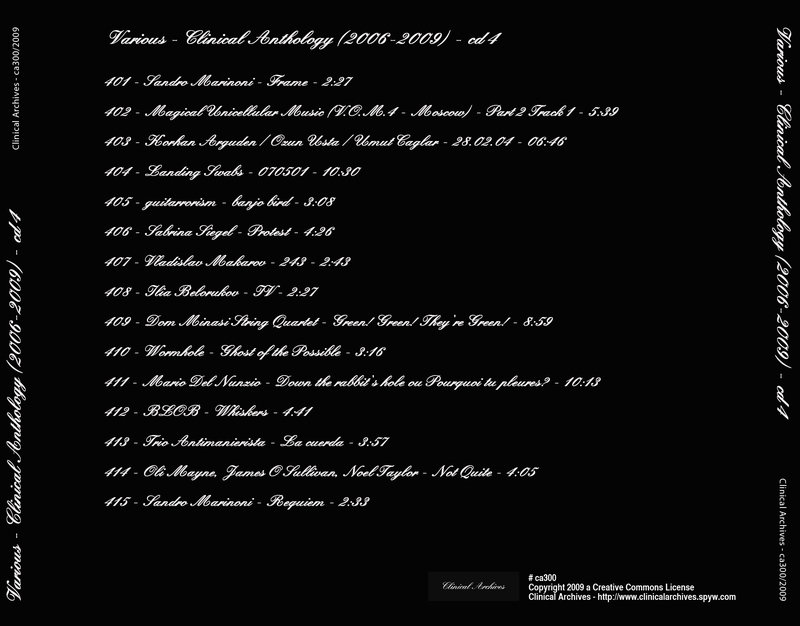 from album "ca217 - Alex Vorodeyev - Stone Island"
from album "ca299 - Johann Merrich - Fricadelique! 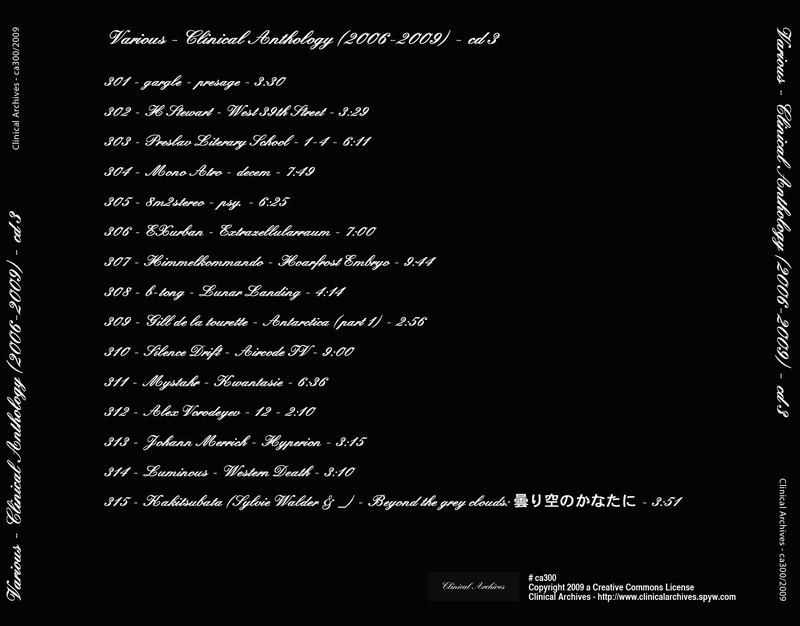 (how to be a flower-power nihilist)"
from album "ca157 - Luminous - The Themed EPs Compendium"
from album "ca181 - Kakitsubata (Sylvie Walder + _) - For _"
from album "ca265 - Sandro Marinoni - Ten Little Songs"
from album "ca240 - Волшебная Одноклеточная Музыка (Magical Unicellular Music) - Камень (Kamen')"
from album "ca122 - Korhan Arguden / Ozun Usta / Umut Caglar - Rehearsals_Part 2"
from album "ca068 - Landing Swabs - Mucking Felt - ep"
from album "ca272 - guitarrorism - recordings without the frogs from the pond"
from album "ca159 - Sabrina Siegel - hand/rock"
from album "ca216 - Vladislav Makarov - Multiplying Real - Multicello"
from album "ca096 - Ilia Belorukov - Saxophone Solos vol.1"
from album "ca288 - Various - re:konstruKt - Sampler vol.3"
from album "ca153 - Henrique Iwao & Mário Del Nunzio - Dance Music"
from album "ca100 - BLOB - Halloween"
from album "ca177 - Trio Antimanierista - No decimos ni que sí ni que no"
from album "ca239 - Oli Mayne, James O’Sullivan, Noel Taylor - Thistledown"
from album "ca057 - Dino Felipe - Kinks - ep"
from album "ca189 - Zaus – Congregation"
from album "ca202 - S'ur - Quadro - ep"
from album "ca295 - Yoko Absorbing - Vinyl"
from album "ca167 - Morgan Craft - Swan"
from album "ca271 - Rastrejo - Dandelon"
from album "ca095 - Nusuth - Flying Home (early works 1978 - 1980)"
from album "ca092 - Djet - Red Rat"
from album "ca275 - dadala - picnic"
from album "ca286 - Humberto Luis Schenone - The Rhythms of Life I"
from album "ca195 - Joe Frawley - Ritual Research"
from album "ca196 - Adeptus - Humanity The Teenager"
from album "ca065 - gunjyo - Mirrors"